You are here: Home / Safety Savvy / Wearable Baby monitors: What’s all the Buzz? Roughly 3,500 children under age 1 die suddenly and unexpectedly in the U.S. each year from unknown causes, according to the Centers for Disease Control and Prevention. The latest generation of baby monitors promise to help reverse this trend. For Stephanie Sjogren, a 32-year-old medical billing and coding specialist from Bristol, Connecticut, those statistics recently hit close to home. When her son, Andrew, was just eight weeks old, he stopped breathing while he was sleeping. Sjogren found out because the baby monitor Andrew was wearing, woke her up. Waank. Waank. Waank. At first, Sjogren, who had been sleeping in bed next to her son’s bassinet, wondered what the strange sound was. Was the monitor malfunctioning? In the dark, she could make out that Andrew’s tiny arm was oddly bent. When Sjogren picked Andrew up, he arched and didn’t make any noise. “I turned on the light and noticed that he had formula all over him, including in his nose,” she says. Baby Andrew’s pediatrician had put him on a special, thick formula for preemies designed to promote weight gain. Andrew had had a feeding before bedtime. In a second, Sjogren realized what was happening: Andrew was suffocating on regurgitated formula. When Sjogren recounted the incident to Andrew’s pediatrician, he explained that infants aren’t inherent mouth breathers. If their nose is clogged, they don’t know to breathe through their mouth. The good news is that Andrew survived and he’s doing great. He’s now 10 months old and has outgrown his reflux issues. Whew! But he still wears his monitor every night. “You just never know,” his mother says. Baby monitors can be an extra set of eyes and ears that allow you to keep tabs on your sleeping baby. Wearable monitors—body sensors that track heart rate, oxygen level and movement—take infant and toddler surveillance to a new level. They allow you to detect a baby’s stealth distress signals—those that you can’t always see or hear, especially in the dark. Thinking about buying a wearable baby monitor? Here’s a rundown of what’s available and how wearable baby monitors work. The Owlet Smart Sock is a little foot sock babies can wear while sleeping. You slip it on your baby’s foot at nap and bedtime. The monitor will sound if your baby’s heart rate or oxygen level fall below a predetermined threshold. The Owlet Smart Sock uses pulse oximetry to check heart rate and oxygen saturation of the blood. It’s the wireless version of the same technology used in hospital NICUs. Pulse oximetry is used in hospitals to measure how well oxygen is being sent to parts of your body furthest from your heart, such as the arms and legs. The gist: The Owlet monitor shines a light on your baby’s skin. It estimates the amount of blood flow and oxygen saturation based on how much light is transmitted to the sock’s sensor. It uses low-emission Bluetooth technology to communicate that information to a nearby base station. The base station will sound an alarm if your baby’s heart rate or oxygen saturation level appear to be out of range for whatever reason. It will also emit a red light. On the other hand, if things are okay, the base station light will give you the green light. The Owlet also includes an optional free app that allows you to track your baby’s heart rate and oxygen saturation from your iPhone or Android. The app communicates with the base station through Bluetooth. You can use the Owlet without the app. You don’t need WiFi for the device to work. Still, the app is convenient. The app allows you to get vitals in real time. The Owlet comes with a one-year warranty and a 100-day satisfaction guarantee. If you’re not satisfied within the first 100 days, you can get your money back, no questions asked. You have to charge the Owlet every day, which is one more thing to do. The base station must be plugged it (it isn’t wireless). That means there are cords. Don’t put the base station in your baby’s crib. “It’s for night time monitoring only,” Sjogren says. If your baby moves around a lot, the Owlet isn’t accurate, says Sjogren, based on her experience. Sizes: The Owlet Smart Sock comes in three sizes and fits babies from birth to 18 months (or less) depending on your baby’s size. Safety testing: According to Owlet’s co-founder, Jordan Monroe, the device has been tested on 3,000 babies in 3,000 homes in conjunction with physicians at the Mayo Clinic (made possible with a $1.5 million grant from the National Institutes of Health). “We’ve monitored over 2 million heart beats,” Monroe says. Their mission: To see if wireless pulse oximetry can help solve problems for consumers. The Owlet is currently undergoing clinical accuracy testing for FDA approval as a wireless medical device (to be sold to hospitals). The Owlet Smart Sock has not yet been cleared by the FDA as a medical device. The upshot? It’s not a substitute for a hospital pulse oximeter, if your doctor recommends one. Also, the Owlet doesn’t profess to help prevent SIDS. What is the Baby Vida monitor? Similar to the Owlet, the Baby Vida is a foot cuff that uses pulse oximetry to measure your baby’s heart rate and oxygen saturation levels. It transmits that information via Bluetooth low-emission technology to your smart phone (iPhone or Android). Unlike the Owlet though, the Baby Vida must be used with your smart phone or tablet computer. In other words, your smart phone or tablet is the base station. Place the Baby Vida sensor on your baby’s heel with the support strap. Slide the support sock over your baby’s foot, to hold the monitor in place. Download the free app and follow the instructions with your monitor. Tiny sensors in the heel cuff wirelessly monitor your baby’s heart rate and oxygen level, using light/pulse oximetry. If the levels of either fall below a predetermined range, the monitor sounds an alarm on your smart phone. There’s no light or alarm in your baby’s room. The device in the sock has a battery that lasts for up to 17 hours before it needs to be charged. It takes 2.5 hours to fully charge. It’s portable. You can use the monitor in your car when you’re driving. It has a dual purpose. “You can use it as a way to not forget your child,” Evans says. When you’re 60 feet from your car/baby, you’ll get an alarm. You don’t need a WiFi connection to use the monitor. It works with 3G and 4G. The device doesn’t work outside of a 60-foot radius. Your smart phone has to be within 60 feet of your baby for this product to work, most likely in the same room. Sizes: The Baby Vida pulse ox sock fits babies from birth to 1 year. Like the Owlet, the Baby Vida monitor is not a medical device. It’s intended for “healthy” infants only, those with an average oxygen level of 94 percent or above. It doesn’t profess to help prevent SIDS. What is the MonBaby Smart Button? The MonBaby Smart Button is a wearable movement detector monitor that’s designed to tell you when your baby rolls over onto her stomach when she’s sleeping. It will also sound an alarm if your baby stops breathing for 15 seconds or more. You track your baby’s breathing and body position through your iPhone or Android phone in real time. 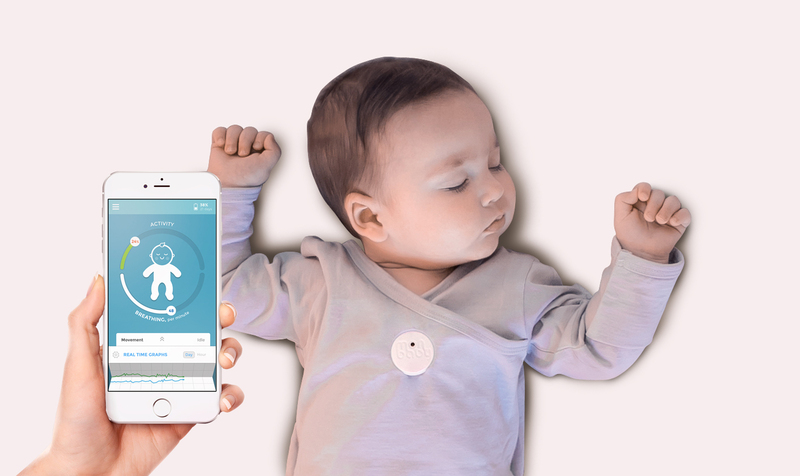 The MonBaby Smart Button snaps onto your baby’s clothing. The sensor in the Button uses a MEMs 14bit accelerometer to track your baby’s movements 6.25 times per second. This information is transmitted to your iPhone through the MonBaby app using Bluetooth Low Energy technology. Pros: The MonBaby Smart Button is powered by a 3V coin-cell battery that doesn’t require charging. It should last you for two months (nightly monitoring only). It attaches to any type of clothing, in the chest area. Cons: The device gets both positive and negative comments on Amazon. Be sure to read up before buying any wearable baby monitor. Radar: Choking hazard? The company says MonBaby Smart Button passes the choking tube test. The inner enclosure measures 1.3 inches, which means it’s too large to fit through a choking tube, which is 1.25 inches in diameter. If you’re still worried about choking, you can setup an alarm for a spike in activity, which could signal that your baby is playing with the smart button. MonBaby has a 40 to 60-foot range. The company recommends placing your smart phone and the MonBaby button in the same or adjacent rooms. MonBaby isn’t a medical device. Like the Owlet and Baby Vida monitors, it’s not intended to diagnose, treat, cure or prevent any disease, including SIDS. What is the Snuza Hero? It’s baby monitor is a wearable device that attaches to your baby’s diaper at the belly to monitor abdominal movement. If no movement is detected after 15 seconds, the monitor will vibrate, a rouse warning. If movement doesn’t resume in 5 more seconds, a loud alarm will sound. What is the Snuza Go!? The Snuza Go! is a clip-on baby monitor that also attaches to your baby’s diaper. 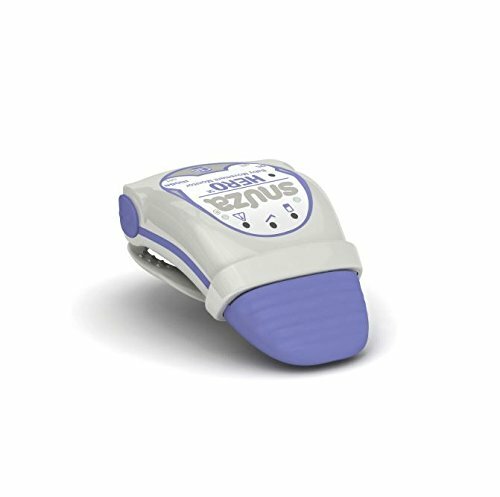 It also monitors abdominal movement with this slight difference: If no movement is detected after 20 seconds, the Snuza Go! will emit an audible alarm. It will also alert you if your movements are very weak or fall to less than eight movements per minute. The main difference between the Snuza Hero and the Snuza Go! is that the Hero has a vibration/rouse warning feature. With both the Snuza Hero and Snuza Go, the device’s colored flexible tip, which contains a movement sensor, must maintain constant contact with your baby’s tummy. For the Snuza Hero or Snuza Go! to work, your baby’s diaper must fit snugly. Both Snuza wearable monitors are powered by CR2 batteries, which are available on Amazon and in most stores where batteries are sold. Pros: The Snuza Go! is light, weighing just one ounce. Cons: Neither the Snuza Hero and Snuza Go! are geared for travel. Movement, such as being pushed in a stroller, makes the monitors inaccurate. Reserve them for when your baby is sleeping and staying put. The next generation Snuza, the Snuza Pico, which also attaches to a baby’s diaper, will track temperature and movement from your iPhone or tablet. But it’s not yet available. “The app needed refining,” a representative told me. With the Mimo Breathing Monitor, your baby will wear an all-cotton kimono or bodysuit that contains a pocket for the monitoring device (“turtle), which uses Bluetooth Low Energy technology to connect with your smart phone. You can monitor your baby’s body position, breathing, sleeping temperature, activity level and whether he’s asleep or awake. This data, along with audio, gets sent in real time to your phone. The kimono and bodysuits are machine washable and available in various sizes. It gets mixed reviews on Amazon. Wearable baby monitors promise to give new parents like you peace of mind. Still, the safety data behind these wearable devices is very much in its infancy. Wearable baby monitors must pass safety standards related to phthalates, lead and small parts (choking hazards) in accordance with Consumer Product Safety Improvement Act. Otherwise, they’re not strictly regulated by the Consumer Product Safety Commission, the FDA or the FTC. In other words, they’re not on anybody’s radar. Before purchasing a wearable baby monitor, here are the top issues to consider. Because many wearable baby monitors use Bluetooth technology, they rely on radio-frequency (RF) energy, a form of electromagnetic radiation, to function. Although the RF energy wireless devices give off is weak and presumed to be safe (it’s not the same radiation used in an X-ray), increasing evidence suggests that it may pose health hazards, especially if it’s emitted close to your body. Environmental health experts are concerned about the “electrosmog” from all wireless devices, especially those that very young children wear for hours at a time. “There’s no way a wearable baby monitor is good idea, barring a seriously ill infant that’s in an incubator,” says Devra Davis, Ph.D., founder and president of the nonprofit Environmental Health Trust. The non-profit organization educates individuals, health professionals and communities about controllable environmental health risks and policy changes needed to reduce those risks. “Any exposure to radiofrequency radiation from a newborn baby is very dangerous,” adds David O. Carpenter, M.D., director of the Institute for Health and the Environment at the University of Albany. “Exposure to radiofrequency radiation falls off with distance. The farther an RF-energy-emitting device, such as your cell phone, is from your body, the better. But if you put a monitor right on babies, they’re going to get the full whammy of whatever intensity of radiofrequency radiation is used,” he says. Is the evidence overwhelmingly strong for the risk of radiofrequency radiation? “No, I wouldn’t go to the point of saying that absolutely no parent should consider a wearable baby monitor,” Dr. Carpenter says. “I do think, however, that every parent who is even thinking about it should be very aware of the risks that are documented and even of the risks that aren’t as well documented, but that appear to be likely. For a normal newborn or young child, I think the risks significantly outweigh the benefits,” he says. 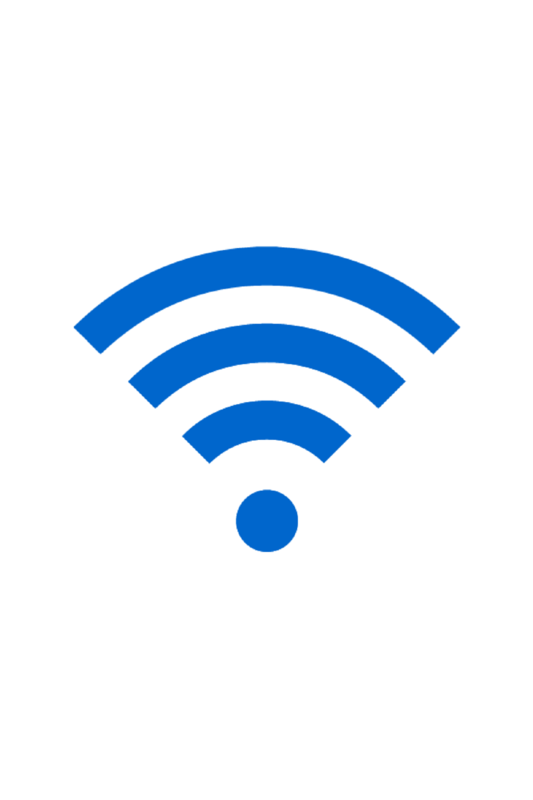 For more info about the possible risks of RF energy for children, check out my Parents piece, “How Wireless Devices Can Be Dangerous for Your Family,” this from Consumer Reports and Parentsforsafetechnology. Issue #2: False Sense of Security? Another possible pitfall of a wearable baby monitor is that you’ll rely on it too much. All wearable baby monitors claim not to reduce the risk of SIDS. It’s a good thing. “What they can give parents is a false sense of security thinking their baby is safe, causing a decrease in vigilance in regard to lifesaving safe sleep messages,” Reno says. –Always place your baby on his/her back to sleep. –Bed sharing is a major no-no. “Sharing a bed, couch or chair with your baby is dangerous. Accidents can and do happen,” Reno says. Always place your baby in his/her crib, play yard or bassinet to sleep.–Offer a pacifier at nap time and bed time during your baby’s first year. –Keep in mind that bare is best. 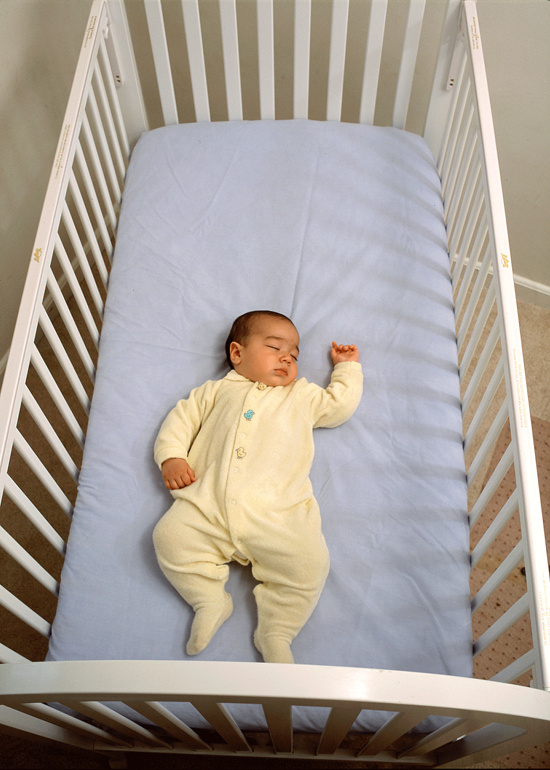 Don’t put anything in your baby’s crib (bassinet or play yard) except for a tight-fitting crib sheet and your baby. Go ahead and dress your baby in a wearable blanket to keep your baby warm and from her legs from going through the slats. For more info about safe sleep, visit the CPSC’s Crib Information Center.